Find hotel near Rambuttri Village Inn And .. 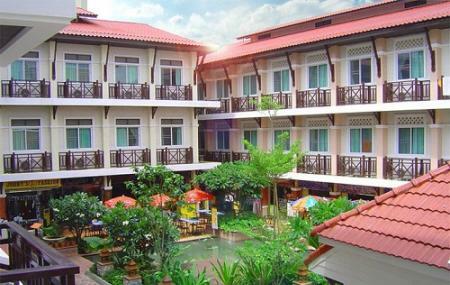 If you are looking for central accommodations in Bangkok, the Rambuttri Village Inn & Plaza can be a great choice. Given its proximity to the hustling Khao San road, this hotel serves various purposes like leisure, entertainment and food indulgences. Also, visit the popular attractions in the city by following Bangkok itinerary 7 days. How popular is Rambuttri Village Inn And Plaza? People normally club together Prom Ratchada Residence And Spa and Panpuri Organic Spa while planning their visit to Rambuttri Village Inn And Plaza. We stayed at Rambuttri Village In for three nights. The staff are very polite and helpful. The pool is on the roof. It's nice and clean with enough sunbeds around to lay on. The rooms are clean, as well as the bathroom. A little but; the AC is noisy. We enjoyed our stay. Definitely going back. Nice place to stay. Excellent location. Near by you can find plenty of good places to eat and to walk around. The room could have better closets. Anyway, we can live without it. The breakfast is really varied and good! The best is the location. In the heart of the city, shopping centers, tourist attractions, restaurants and bars · It is easy to access by car · Close to public transport and the airport. It has a room with very cheap prices. Not really bad, but also not really good. The swimming pools on rooftop are enjoyable. The receptionists are not really welcoming. It's really mass tourism hotel without any real identity. However breakfast is various and good, this was the good point with a perfect situation next to Khaosan Road and touristic places.